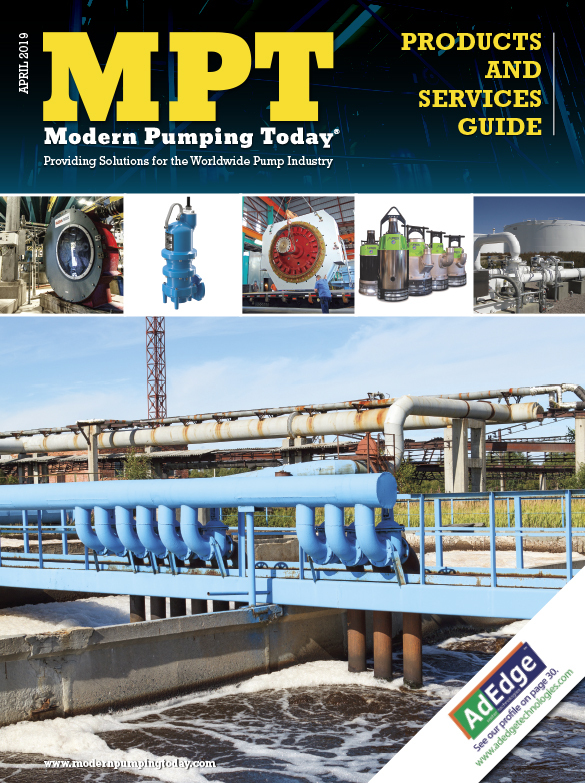 During the first century of centrifugal compressor design, changes were evolutionary. A centrifugal compressor from 1900 looks very much like a centrifugal compressor manufactured in the year 2000 with regards to the location of compression stages, seals, bearings, and drivers. Over that century, there were some definitive design improvements. Computer modeling allowed for improvements in the design of impellers, and advances in manufacturing provided the flexibility to actually fabricate those impellers. In oil bearing technology, tilting pad bearings enabled improved performance over plain journal bearings. In seal technology—where gas bearing technology really had its genesis in turbo equipment—aerodynamic bearing technology was used as a very effective non-contact seal, replacing oil-based seals. But a technological revolution could be coming, driven by improvements in high-speed motor/generator components, high-strength, high-temperature materials and externally pressurized gas-bearings/seals. The advantages of these components may well combine symbiotically, allowing for new machine architectures, higher speeds, pressures, temperatures, and efficiencies. Improvements in electric motors have been relentless, with each improvement reducing costs. Direct-drive, high-speed motor/generators, and controllers enable improved power densities, cost structures, and reliability that can be more effective than larger, slower motors and step-up gearboxes. As in other industries, like the machine tool industry where integral motor spindles have eliminated belts, couplings, gears, and relative alignments, motors are getting closer to the work being done. The next two decades will likely see enabling developments in materials also. Ceramic matrix composites (CMCs) and carbon/carbon composite materials, which are high-temperature materials originally developed for applications in rocket nozzles and brake discs for Formula 1 cars, will find their way into high-speed rotor applications. CMCs were first used in gas turbines as power turbine blades; they were able to exceed the temperature limitations of metal blades, allowing higher temperatures and improved turbine efficiencies. These are also the early days of super critical CO2 and the Brayton Cycle for power generation. In the future, the Brayton Cycle, developed largely for the military because of its 10x power density over Rankine cycles, could become common. This could lead to very compact gas-fed power stations that could be permitted close to demand centers and fit with a new “distributed power generation” model. CMC materials will be important in solving erosion issues in high-energy-density impellers. Used as dry gas seal (DGS) faces, CMCs have the strength and temperature stability of the more commonly used silicon carbide faces, but are not brittle and so will not shatter catastrophically. These materials would offer other design improvements for rotors and stators, like the ability to increase or decrease thermal expansion and conductivity. Insulative properties like those of the space shuttle heat shield tiles will become important in structural components as the drive for higher efficiencies in power generation leads to higher and higher temperatures. Because turbines and compressors become so much smaller as speeds increase, composite ceramics become practical for structural components such as rotors and stators also. Gas-bearing technology could pick up on the material advances too, allowing for hot-immersed operation. That means there could be oil-less gas bearings operating on process gases and at process temperatures, allowing the bearings to move from the ends of the shafts to a position inside the sealed area, even directly between or on impellers. The bearings can be positioned where the work is being done in the compressor. This would be a revolutionary change in rotordynamics, but only the beginning of the potential paradigm shift in compressor design. In the first years of the twenty-first century, Bently Pressurized Bearing Co. introduced externally pressurized bearings with high unit loading and zero-friction starts and stops. Readers may be familiar with Don Bently as the first to apply eddy current probes in the study of rotating equipment. These probes allowed him to “see” mode shapes of flexible rotors. Bently Nevada Corp. was born out of this vision. After selling Bently Nevada to GE in 2002, Bently founded the Bently Pressurized Bearing Company. He wanted to offer solutions to the fundamental problems he had experienced in rotordynamics. “Pressurized bearing technology is destined to be as influential as the eddy current probe in revolutionizing rotating machinery,” he said. Externally pressurized bearings were certainly promising, combining the advantages of oil, foil, and magnetic bearings. An advantage that Bentley was quick to point out is that input pressure to the bearing has a direct relationship to stiffness and damping. This gives the ability to tune bearing coefficients while the machine is in operation, as with magnetic bearings. 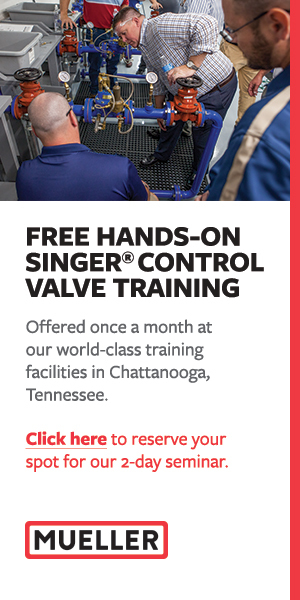 Unfortunately for Bently, he was using orifice compensation. Compensation is restriction of flow into the bearing gap and a defining characteristic of hydro or aerostatic bearings. To get pressure to evenly distribute in a thin bearing gap when it issues from a small hole is not easy. When the gap gets too small, the area around the orifice chokes flow to the rest of the face, causing collapse of the air film, which results in contact. There is a more elegant type of compensation. Instead of the restriction of an orifice, the pressure is introduced into the gap through a porous material. The gas pressure bleeds out of millions of small holes across the full face of the bearing and acts on the counter surface like the end of a noncontact hydraulic cylinder. Graphite and carbon, naturally porous and familiar to turbo industries, were the first porous materials employed as compensation in externally pressurized porous (EPP) gas bearings. The technology offers turbo industries oil-free bearings with zero friction that can take the high loads of oil bearings, the temperature extremes of foil bearings, and have adjustability from outside the machine like magnetic bearings. 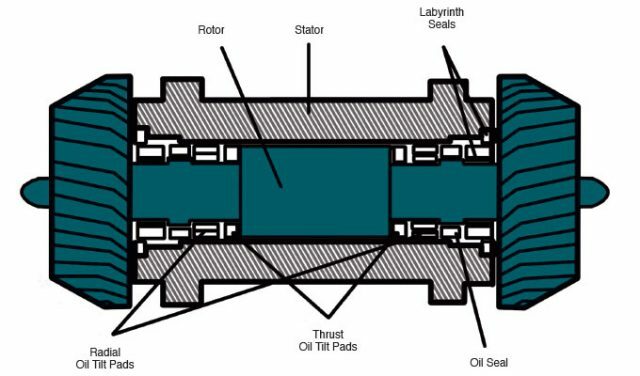 The seal division at Flowserve was one of the first to recognize the advantages of EPP gas bearings, but—interestingly—as seals, not bearings. The high pressure created in air bearing gaps is an impossible barrier for any gas at a lower pressure. The seals in development now, will allow very reliable dry gas seals in multiphase compression, as nothing flows across the seal face from the process side. Because the gas bearings are simple and low-cost relative to DGSs and work at 0 RPM, Flowserve and others will be able to offer gas bearing seal technology into many more applications economically. So is it a seal or is it a bearing? Hydrodynamic thrust bearings are segmented into pads so there are leading edges for oil wedge development. No engineer would consider this for a seal because of the big radial gaps. But an EPP thrust face is a continuous 360-degree face. It looks like a DGS face, and because the pressure is always highest in the EPP gap, it is already a seal. So in straight-through compressors with the EPP thrust bearing acting on the drive end, area on the thrust runner could react to the thrust loads, while also serving as a DGS. Another advantage that Bently would have been sure to point out is that by combining the thrust bearing, DGS and balance piston in the same axial space, the rotor gets shorter and stiffens on a cube function, dramatically improving rotor dynamics and reducing required clearances. Still, the long shaft through the compression stages is the weak link. Large clearances are needed between the stator and rotor to account for excursions of the shaft at critical speeds, manufacturing tolerances and for the thermal growth of the shaft. Flow through a gap is a cubed function of the gap, so reducing running clearances between stators and impellers is a low hanging fruit for improving compressor efficiencies. With high-speed motors integrated directly into each impeller stage, and each impeller supported on its own gas bearing/seals, they could be spun at higher speeds as a rigid body with tight clearances. Additionally, each stage could be rotated independently at its most efficient RPM for the compressor as a system. This would truly be the dawn of a new age in centrifugal compressor design. In an expander/compressor (see figure 1) with opposing stages on the same shaft, the current paradigm is to support the shaft on oil bearings near the center, reaching through oil seals, then labyrinth seals, and then finally the shaft supports impellers, which need to have significant axial and radial clearances at their perimeters where they are doing most of their work. This is done to account for rotordynamics and other motions of the shaft, which cannot be very stiff, as the shaft length from bearings to impellers is a multiple of its diameter. This design is also complicated by the need for oil, which changes viscosity with temperature. The next design change in expanders could eliminate the conventional oil bearings and replace them with gas bearings that support the impellers and provide sealing directly on the back of the impeller (see figure 2). This would enable dramatically shortening the shaft. 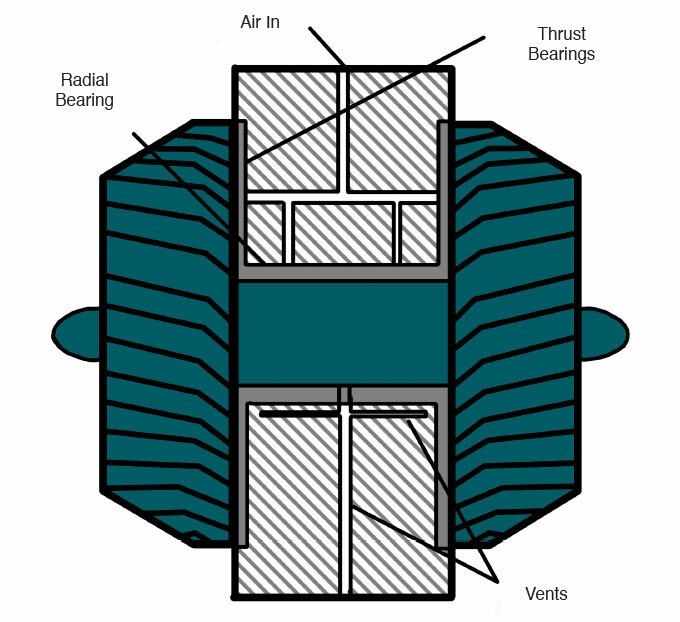 The bearing/seals could operate on process gases, steam or at cryogenic temperatures. Cost effectiveness and simplicity of this design could make energy recovery more economical. 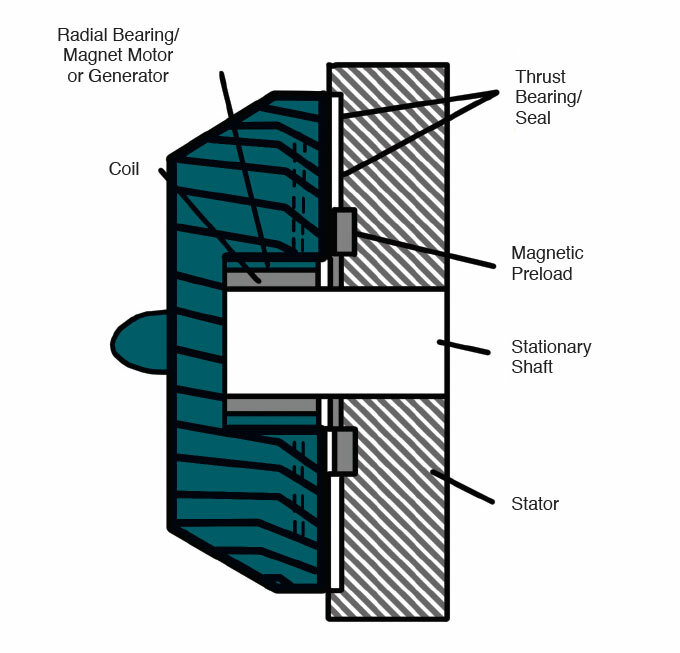 In figure 3, there is no longer a rotating shaft, instead the ID of the impellor is fitted with permanent magnets and coils are arranged in the stationary center pin, turning the motor/generator inside out. High relative surface speed was conductive to high voltage dc generation. High-voltage dc generation is advancing and fits with the trend in high-voltage, direct-current (HVDC) transmission. High-speed motors and generators could swap power through local HVDC micro grids with more flexibility than physically tying expansion to compression through a rotor. This is a vision of motors and materials cooperating with pressurized gas bearings and seals to drive closer to the work being done, but there is still at least one step left. Motors and bearings are still separate elements, occupying separate space in the compressor. That is, until it is realized that neodymium magnets are porous, and can be made into an aerostatic bearing element. Yes, the motor could be the bearing, too! Permanent magnets in motors could become the gas-bearing surfaces as soon as 2020. The efficiency and power of a permanent magnet motor or generator could be increased by minimizing the distance between the coils and the magnets. Gas bearing technology is the way to reliably reduce this clearance. The combination of motor and bearings would create assemblies that are shorter and lighter than if the motor and bearing elements remain separate components. This would be the first same-body experience for the electrical and the mechanical engineer, and the ultimate in the design engineer’s continuing drive to achieve more functionality in less space, at least for now. Drew Devitt is the founder and chairman of New Way Air Bearings. Bently Bearings, by New Way Air Bearings, is targeted to rotating equipment, both small, high speed machines where they replace foil or rolling element bearings and large turbines, motor generators, compressors, (where they replace oil hydrodynamic or magnetic bearings). Visit Bently Bearings in Booth 1315 at the 2018 Turbomachinery and Pump Symposia.